Whether you feel more comfortable enjoying a fish sandwich with the locals at a beachside shack or getting dressed up for a sophisticated dinner amongst celebrities, our list of top 10 places to eat in Barbados is sure to come in handy if you’re planning on holidaying on this Caribbean island. Popular amongst local divers looking for a place to reenergise after a morning spent in the sea, Cuz’s Fish Shack in Bridgetown is a great choice for lunch. This low-cost casual shack stands out from the crowd thanks to its bright colours and fish sandwiches which are said to be the best in Barbados. For a very reasonable price you can enjoy a freshly prepared piece of fried fish, topped with crispy salad, a fried egg and smooth cheese, all tucked into a fluffy white bun. Each sandwich is cooked to order, so although you might have to wait a while, it’s worth it to be able to enjoy one of the freshest sandwiches you’ll ever have under the cool shade of a palm tree on the beach close to the shack. There are plenty of different types of fish to choose from, including flying fish, dorado and marlin, but if you can’t decide what to go for, ask Cuz to make you whatever he recommends. Travel south from Bridgetown and you’ll find yourself face-to-face with Brown Sugar, a restaurant which is famous for its decadent all-you-can-eat planter’s buffet lunch. This four-course unlimited meal is a feast for the eyes as well as the stomach, with an incredible selection of Bajan dishes presented elaborately on a table for diners to enjoy. 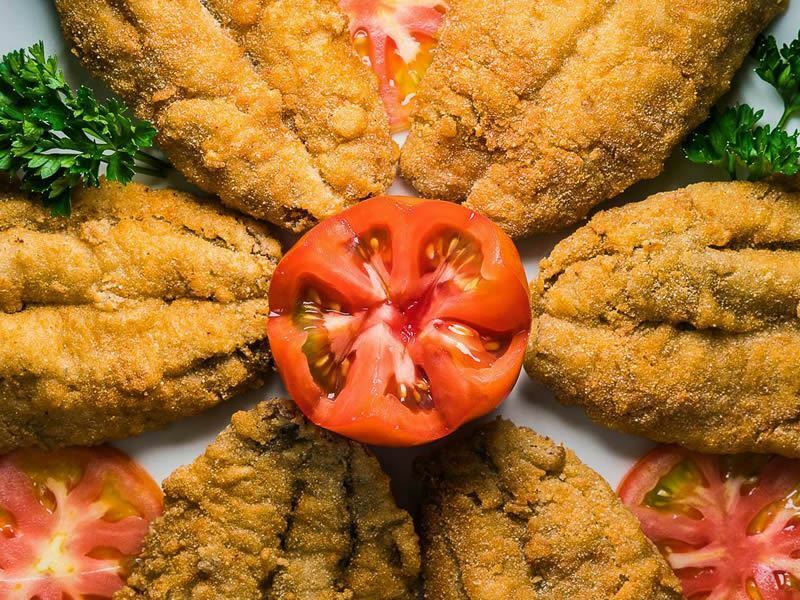 You’ll find loads of Barbadian and Caribbean specialities available here, including cou cou, flying fish, bul jol, fish cakes, souse and a seemingly never-ending choice of homemade desserts. 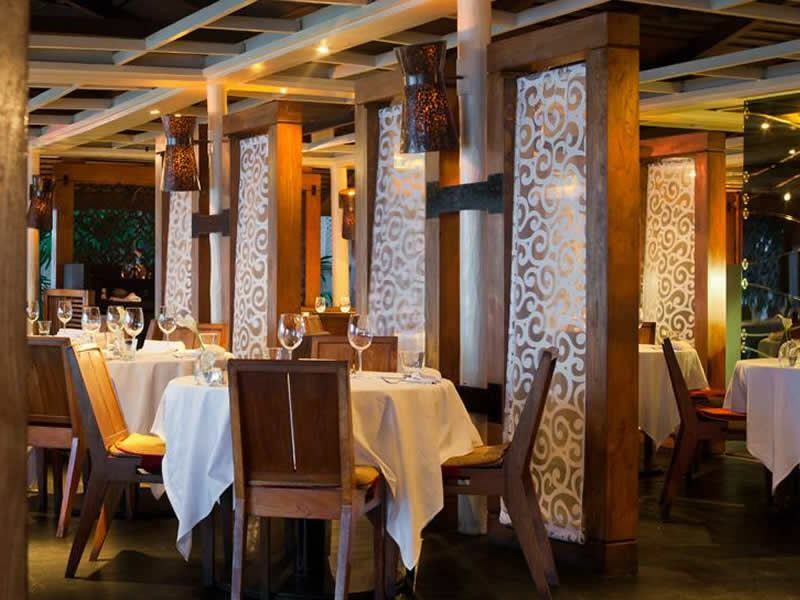 The perfect fusion of casual and elegant dining, Brown Sugar is decorated in a fitting tropical theme, with fern-filled patios, exotic flora, cascading waterfalls and chirping tree frogs, making it feel like you’re dining in a genuine jungle. Authentic Bajan cuisine combined with amazing surroundings is sure to create a dining experience which you’ll never forget, earning it a space in our top ten places to eat in Barbados. After earning the reputation as one of the best restaurants in Barbados, Champers relocated to a quiet area, just off the main South Coast road, in a traditional Barbadian building. The restaurant now boasts an unparalleled cliff-top location which overlooks the Accra Beach and awards guests with panoramic views which stretch out across the glistening ocean. Here you’ll find two dining areas – a waterside casual gazebo downstairs and an elegant dining room upstairs, both of which provide diners with lounge and bar, as well as internet access. Like many restaurants in Barbados, Champers Wine Bar & Restaurant specialises in freshly caught fish and seafood, although there are plenty of vegetarian and meat-based dishes for diners who aren’t in the mood for fish. With an incredible collection of wines and champagnes from all over the world, wine lovers will be in their element and if wine isn’t your thing, you’re bound to be impressed by the extensive cocktail list, with a number of drinks made from fresh locally-sourced fruit. 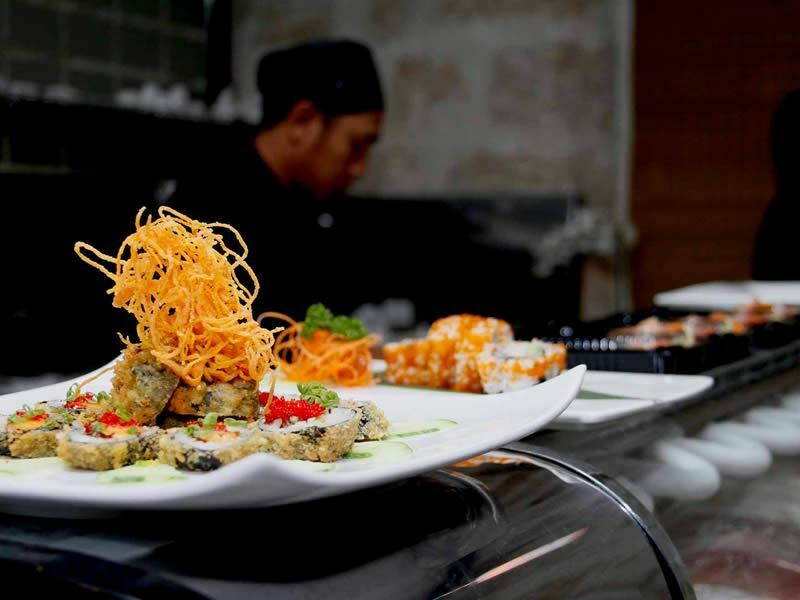 The award-winning Nishi Bistro & Sushi Restaurant in Holetown offers diners a wonderful fusion of Asian and Caribbean cuisine. The restaurant’s head sushi chef has been in the industry for 15 years and has worked in some of the most prestigious restaurants in Miami and New York, as well as the highly-regarded Shangri-La Hotel in Indonesia. There are two menus available at Nishi: a combined sushi and sashimi menu and a bistro menu, ensuring something to suit every diner’s palate. Diners have three seating areas to choose from: the upstairs dining room where you can watch skilled chefs prepare sushi, the downstairs dining room which boasts a chic atmosphere and the open-air courtyard which is perfect for a casual meal with friends or family. As well as the dining areas, there is also a bar and lounge open to guests, where you can choose from a large list of speciality cocktails. Just a short drive away from Dover Beach in the lively fishing town of Oistins, Oistins Fish Fry in Oistins Bay Gardens is always packed on Friday and Saturday evenings, when locals and visitors alike head to the area to sample freshly prepared local delicacies. Here you’ll find a number of stalls to choose from, each of which is grilling or frying batches of fish. There is an excellent selection of food available, including swordfish, tuna, mahi-mahi, marlin and flying fish, as well as lobster and chicken. There is plenty of casual, rustic seating available for everyone, although because of the popularity, you’re almost guaranteed to find yourself sharing a table with other diners or possibly some locals playing dominoes. The atmosphere is truly Caribbean with the smell of fresh fish floating through the air alongside the sound of Bob Marley, with a beautiful sunset taking place in the distance. Regarded by many as one of the best fine dining restaurants in Barbados, Tides Restaurant is located at the water’s edge in a prestigious coastal area of Holetown. There are four different dining areas to choose from, each with its own ambience and character. The tree house is an open-air dining area ideal for casual meals, whereas the red tile section is also open, but it imbues a more sophisticated atmosphere and features amazing sea views. The garden gazebo is the most popular dining area, where you can enjoy your meal surrounded by lush flora, as well as fantastic ocean vistas. There are various menus available for diners to browse – including a dedicated vegetarian menu and a comprehensive kids’ menu – ensuring something for everyone to enjoy. The main evening menu features several fish and seafood dishes, with a few meat-based options to choose from, too. To accompany your meal there is a vast array of red, white and rosé wines, as well as several champagnes, available which have been imported from all over the world. 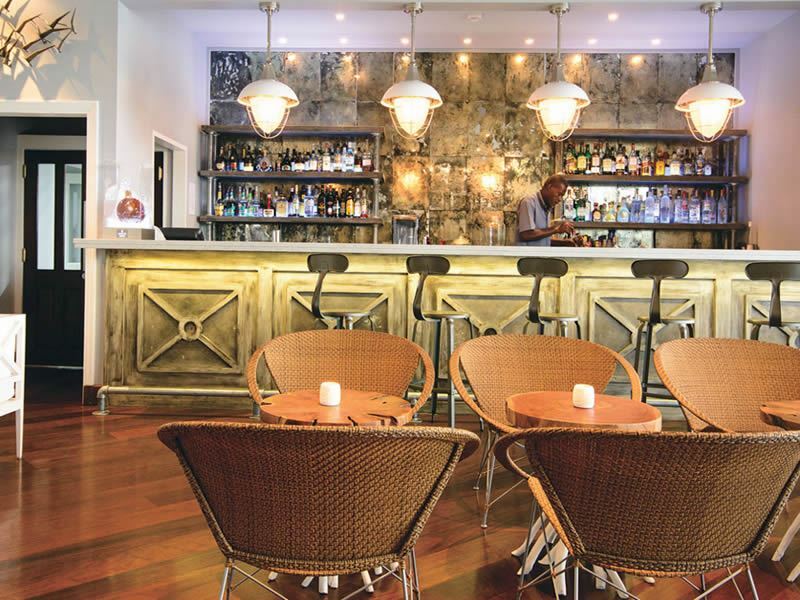 Primo Bar & Bistro (formally Pisces) boasts a privileged oceanfront location in a bustling area of St Lawrence Gap. Popular with locals and tourists alike, this eatery is known for its friendly service and charming ambiance which should not be missed. The establishment itself is decorated with tropical indoor gardens which, when combined with the authentic flavours of the food, creates a true sense of Barbados. Here diners can choose from an extensive international menu which has a touch of West Indian influence and a number of fresh seafood specialities. With so many options available, you’ll be spoilt for choice when it’s time to order. 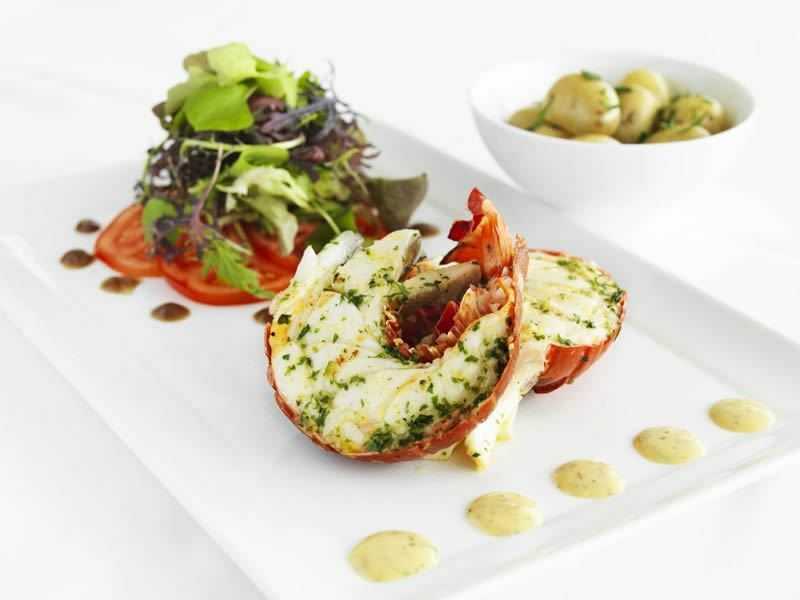 Starters such as seared scallops and local asparagus grace the menu, followed by delicacies like West Indian chicken curry and Caribbean live lobster for the main course. If you’re still feeling a bit peckish, you can indulge in a decadent dessert, such as caramelised fresh bananas or white chocolate cheesecake. The recently-opened Waterside combines all the right ingredients needed to become a favourite amongst discerning diners – an unbeatable location, outstanding food and excellent service. Found along the seafront in the vibrant St Lawrence Gap, this restaurant is home to a multi award-winning head chef who is supported by a dedicated team. The chef and his team work closely together to create the elegant fusion of flavours in each and every dish that Waterside is known for. The menu focuses heavily on fish and seafood, with choices such as pan-seared ruby snapper and tandoori roasted tiger prawns proving popular. If you’re not in the mood for fish, there are plenty of other options available, including oven-roasted rack of lamb and char-sui glazed Angus beef skirt. The dessert menu is sure to pique the attention of anyone with even the slightest sweet tooth and features opulent items like spiced banana spring rolls, homemade sorbets and white chocolate soufflé. As the name suggests, The Cliff is found perched on top of a small cliff overlooking the shimmering Caribbean waters, with each candlelit table awarding diners with stunning sea views. Situated in a quiet area of St James, this restaurant is quite expensive, but it’s worth splashing out for a special occasion or an ultra-romantic evening. Due to the immense popularity and sparkling reputation of The Cliff, reservations days or even weeks in advance are highly recommended. 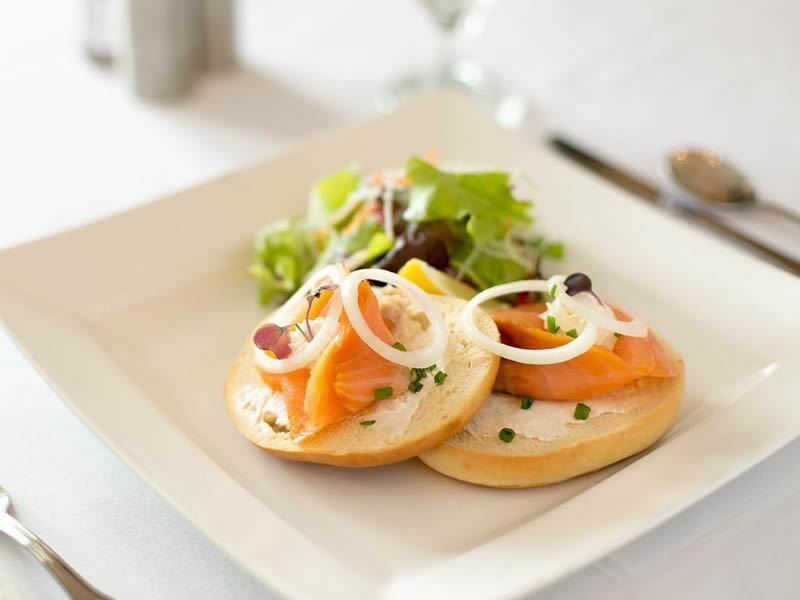 The eclectic menu ensures everyone is catered for and incorporates some amazing dishes. A few recommendations include smoked salmon ravioli with garlic sauce or grilled Portobello mushroom on greens with truffle vinaigrette to start, with char grilled swordfish with Thai yellow curry sauce and seared tuna with saffron caper sauce to follow. There are also plenty of sinful desserts on offer such as warm bread and butter pudding, caramelised lemon tart and chocolate mousse, for those who really want to indulge. 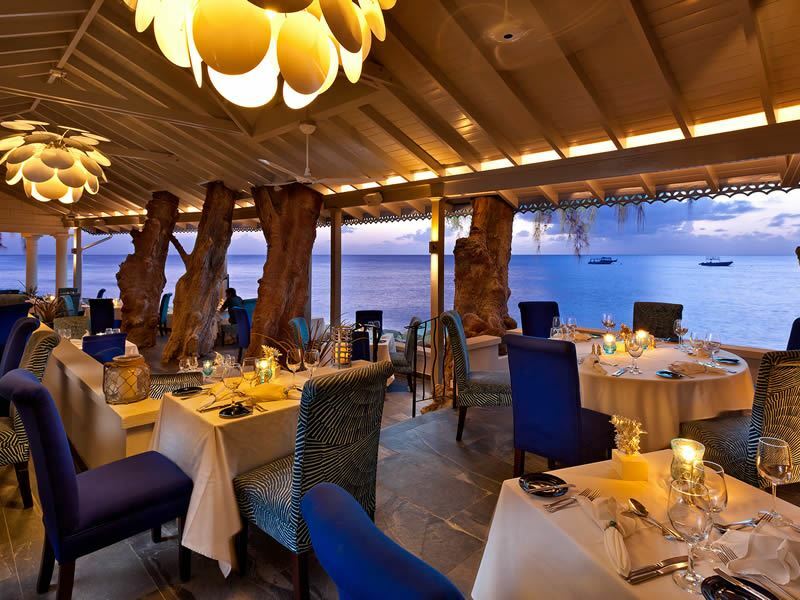 Daphne’s is one of Barbados’ most highly acclaimed restaurants, situated on the West Coast in Paynes Bay. Here diners can enjoy a mixture of island seafood and classic Italian dishes, each of which as a contemporary touch bringing it straight into the 21st century, all in sophisticated surroundings overlooking the glistening ocean. The ideal location for a luxurious afternoon lunch or a romantic evening dinner, Daphne’s offers refined yet inviting dining with genuine Bajan hospitality. The service is utterly flawless and the décor is reminiscent of a fairy tale, with sprinklings of tiny candles, coconut shell lampshades and muslin curtains strongly defining the restaurant’s character. The head chef at Daphne’s has done a wonderful job by creating a menu which combines the very best of Italian cuisine with island seafood, whilst always taking a fresh approach to ingredients, and this is why it’s earned first place in our top ten places to eat in Barbados. 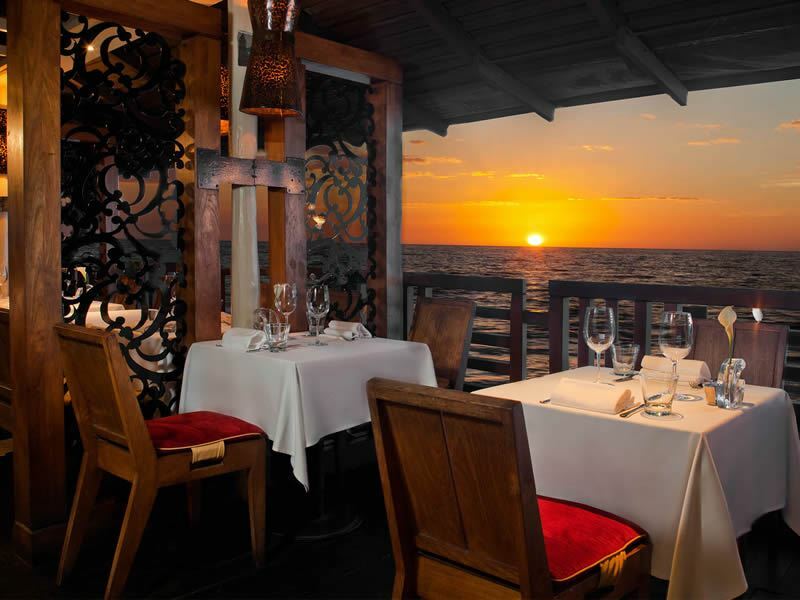 Tropical Sky's Managing Director Mike Collins says: "Cin Cin By the Sea restaurant is my choice for dining on the island. Very modern, vibrant and a cool hangout for locals - it's the place to be seen! For those like myself, feeling a little too uncomfortable to be seen dead in a nightclub, it's absolutely perfect. It offers that hip environment, but with a more chilled vibe. You cannot beat Cin Cin."